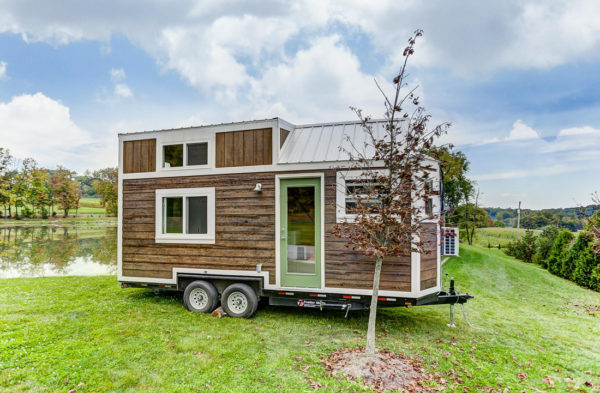 This is the Point Tiny House on Wheels by Modern Tiny Living. It’s a 20 ft. model that’s beautiful inside-out! The home features modern concrete countertops, sage green cabinetry, and more! Our big thanks to Robert Hendricks for sharing! Alex, thank you so much for featuring our newest model! We appreciate it! There’s a lot to like in this one- feels very open and airy and the overhead storage in the kitchen is very clever. But my favorite part? The living room. It just feels like you could have 4 friends over and people would be comfy & cozy but not squished. I wonder if the sofa could be made into a bed…? While probably not intentional, the placement of the rear exterior storage/utility shed can make it easier in case you need to escape the loft in case of fire by going out the rear window and using it as a halfway down platform so you don’t have to deal with the shear drop to the ground, which can really hurt if the house is parked over hard and possibly rough terrain… Rocks, concrete/pavement, roads, gravel, etc. I really like the layout and the living room. Very functional and space for company. If you could come up with a hiding space for a foldable table, the living room could double as dining for guests. Nice work, not crazy about the two door cubby outside, and the price is a bit much, $70,000 is too much. Looks like you guys are missing the point of the tiny home movement. Allowing people to choose what’s important to them and have a home actually designed for them that can actually let them have the life they want to lead instead of being forced to live in a way that may not suite them. What good is a low cost house if you up spending more because it doesn’t actually allow you to lead an efficient life? Do people have to refuse options like solar power because it will raise the cost too high? Do long term cost savings not matter? Or how whether options to live off-grid can allow for finding places that can be more affordable to live? How about someone who needs to live in areas where a normal house may not last very long, due to flooding, forest fires, or even hurricanes? Or how about just extremely cold or hot weather? Options like custom windows that provide high levels of insulation can cost thousands each… Are people who live in those areas suppose to go without windows in order to live where they want rather than pay for the right windows for the region or spend way too much on heating and cooling? How about things like ADA compliance for wheelchair accessibility and other ways a house can be modified to give people who need those options the ability to live comfortably in a house that’s otherwise only designed for young and physically fit people. Are tiny houses only for the poor? What about the other 80% of the population that isn’t classified as poor but still suffer from the present housing market and need better options? There are many reasons why cost can vary a great deal and not violate the intent of the tiny house movement because it’s really suppose to be about appropriate housing and that’s different for each of us. There are always trade offs, with pros and cons to consider and how much you spend is included in those considerations. After all, custom built means not only that it can be designed any way you may want but also that the costs involved can also be adjusted to fit just about any budget and in the end the point is to have something people can truly consider a home. Besides, it’s the life Tiny Houses allow that the true savings are provided… Being more sustainable, efficient, less wasteful, etc. Really, what is a one time cost saving compared to a lifetime of cost saving that will far exceed it? Do feel better now, that you posted a lecture, funny how you preach individuality but find fault in my comments. But part of the point is for people to have a better understanding of each other and our individuality. So as to accept the differences and allow each of us to do it our own way without being judged and pressured to conform to some proprietary standard that can never encompass all of us. It’s why people ultimately get forced to conform to ways of life to the point they either conform or they’ll be forced out, evicted and made homeless or even thrown in jail if they refuse to conform. Things like HOA’s making it so people can’t just paint their homes any color they want, or do things like fly the Flag, or install things like a wind turbine to lower their carbon footprint all because it doesn’t fit their definition of how it should be done and protect what they consider is important for property value. It’s what leads to stereotypes, such as inferring that certain forms of housing are only for the poor/homeless or the rich and thus eliminates choice and limits resources a range of option could have otherwise had if they were more accepted. Mind that one of the stereotypes holding Tiny Houses adoption is the association with low quality mobile/travel trailer homes and the stereotype that they are low quality homes that many feel should be kept separate from all other housing. Such stereotypes are usually unfounded but it doesn’t stop people from using them to justify opinions that Tiny Houses are not for most people and may even be dangerous. So sorry if I come across as overly preachy, I just see it as a pattern of behavior and way of thinking that can cause problems regardless of intentions. The wood in the interior is very pretty. There’s a lot of it everywhere. Wonder if it might make you dizzy after while. But it’s very well done. I like this one. I might want to make some changes but the floorplan looks great. This is a beautiful THOW, but with no oven and no washer/dryer I think the price is a little high. Not for me, anyway, because I am looking for a bedroom on the ground floor. Love the colors and the wood used in this, though. Wish more THOWS were designed for older people who don’t want or just can’t do the stairs/ladders. James D., Not everyone agrees with your idea of what going tiny means. As for me it means getting away from the over priced, over sized housing we have gotten used to living in. I now have a 10×16 cabin that started out as a storage building. It has two lofts, the front loft is half the size of the back loft. Neither is used for sleeping, not yet anyway. But this isn’t about me and what I live in. It is about a THOW that to me is 3/4’s done and an asking price that is way higher than anything I would even consider to pay for a place to live. Now for my opinion of this THOW, like someone mentioned no washer/dryer or space to put one and no closet that I see. Where am I suppose to hang my clean clothes? Is that it in front of the bathroom? If it is it not holding a lot of clothes especially for two people. Climbing stairs every night to go to bed might work for younger people, but not this old man. I would have to consider making the couch into a bed for me. I also noticed it didn’t mention a heater and with me living in Okla I have to have a heater for the winter. Even a propane heater is better than nothing. There are always trade offs and the reality is not everyone is either going to want to or be able to do it the same way because we all have different needs and different situations we have to deal with that set what options and things we can do. Someone who has no other choices in a market where even the lowest end apartment will cost them many times more than even the priciest Tiny House doesn’t have the same choices as someone who lives someplace that still offers other options. For all these things cost will not be the same thing… Some people also want to be able to not only go tiny but also be environmentally friendly and more sustainable but that sometimes means paying for materials that cost a lot more to source. The actual point, whether you agree or not, is for people to find what’s appropriate for them… It doesn’t have to be appropriate for anyone else and that’s what actually allows people to live a more efficient life by doing what actually works best for them. Sure, keeping cost lower is preferable but not to the exclusion of actually having a home that fulfills your needs and allows you to have the life you actually want to have. Besides, it still means getting away from traditional housing no matter how people do it… People are still going to be spending less on just about everything by going Tiny and paying more for certain things to make that transition can allow cost savings that can add up to a lot more over time. First off, nothing in your reply addresses this THOW’s. Do you honestly believe a family of eight or someone wheelchair bound can live in this THOW? Nope, me neither. So please keep your comments to the subject of this article which would be this THOW’s, which is over priced to me anyway. Staying with this THOW’s and it says nothing in the description about having solar, which would add to the price of $69k. Add to that the price you would need to put in mirrors since there is not one mirror shown, not even in the bathroom. And the storage space goes along with the name “Tiny.” No storage space in the sleeping loft, shown. My tiny 22ft motor home has more storage space in the kitchen area than this does. At least it has a place to put spices and stuff over the cook stove. Which brings up the fact that there is no place to put towels, wash cloths or a place for any of the other items you would normally put in a bathroom other than that “tiny” space under what they call a sink. This over priced THOW just does not measure up on second look. Speaking of second looks, does that rear storage/utility shed slide in out of the way? There isn’t room for it to slid inside the building as the refrigerator is against the back wall. So I don’t know how that works if it does. (off topic) But just think about this for a second James D. I bought 5 acres with a house that had a nice size bedroom with walk in closet, a full bath with medicine cabinet and a storage place for towels and other stuff over the water heater and storage under the sink, a washroom with washer and dryer, a huge kitchen, a fireplace and a living room across from the fireplace for $20,000 out in the country. But like I said this isn’t about what I had or have it is about a THOW’s that doesn’t have 1/2 the things I would need and at a price way more than I am willing to pay. Maybe that is why I am building my place on my own land for less than $10,000 for everything. This trailer is nice to look at, but I don’t think it would be nice to live in, even for just a week. So I would pass on this one. I forgot to say Thanks to Alex for posting this article. Again, there are many different things people will consider they need and will help them live a more efficient life. The range this factors goes far beyond the few things you’re considering. Fact is this THOW, like many others, were specifically designed for someone and what they wanted out of a home. While this house may not be for a family of 8 it can handle a family of 4, which is still more than 1, as well as a number of different lifestyles people may require in their home to support. There’s also trade offs for different choices… Building on a property and on a foundation can be cheaper but you can’t move your house if there’s a natural disaster headed your way, nor will your building be able to handle a wide range of climates, you’re not required to over build the house to be able to withstand both an earthquake and a hurricane at the same time, you’re not having things custom made just for your house and paying other people to do it, among a litany of other differences. Again, understand there are always trade offs and different people will require different things to meet their needs. Just because it doesn’t apply to you doesn’t mean it’s not worth what they’re asking for someone that it does meet their needs. Would add built-in night tables otherwise I love it! I think this was made for ME! I deeply love all the finish materials chosen. I think it’s a very nice, practical layout also. Well done! Nice. The living area is the opposite of a conversation pit, for elevated discourse. Not bad for a 20 footer. Seems to be adequate storage space to me. It’s amazing what you can pack away if you do it neatly.